Hurricane hunters are often sent to fly into the storm to gather data. 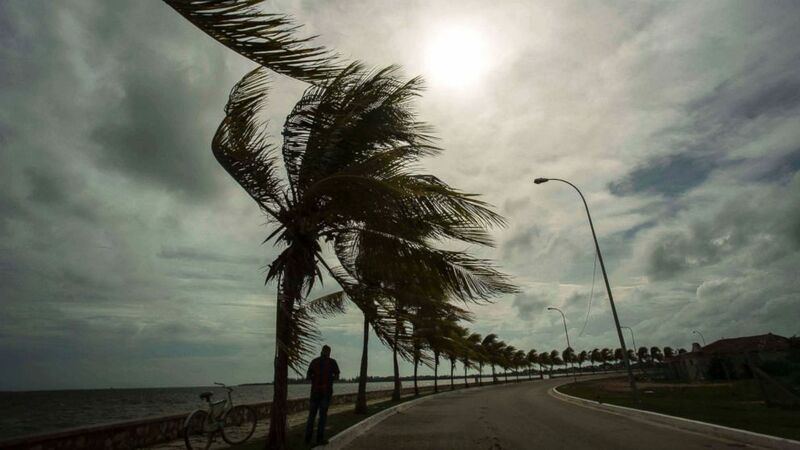 camera (Desmond Boylan/AP) Winds brought by Hurricane Irma blow palm trees lining the seawall in Cuba, Sept. 8, 2017. Hurricane forecasting has made tremendous improvements in the last two decades, allowing meteorologists and officials much more time to warn residents who may potentially be affected by a dangerous storm. In 1992, Hurricane Andrew made landfall in southern Miami-Dade County less than 24 hours after the first hurricane warning was issued, according to the National Hurricane Center. Today's technology allows forecasters to see storms brewing several days in advance, giving residents and emergency managers ample time to prepare. "There's an incredible amount of science and forecaster expertise behind predicting the individual storm as well as making the seasonal hurricane predictions," Dr. Gerry Bell, lead seasonal hurricane forecaster for the National Oceanic and Atmospheric Administration, told ABC News. Meteorologists work "around the clock" when forecasting storms, Bell said. "A lot goes into making a hurricane forecast," Bell said. "... There's a whole suite of tools behind it." Forecasters use "extremely sophisticated" super computers to create a variety of forecasting models, Bell said. "Those models are critical," Bell said. "It's a huge area of research, and there's been a tremendous amount of progress over the years." For storms in the Atlantic, meteorologists often use the American and European models as their first lines of defense. The two long-range models can sometimes pick up on storms 10 days out. Sometimes the data that the models take in results in different outputs -- or possibilities -- and often the American and European models aren't in agreement until a couple days before the storm makes landfall. Closer to landfall, meteorologists begin to incorporate some short-range models for forecasts, including the North American Mesoscale Forecast System (NAM) and the Rapid Precision Mesoscale model (RPM). GOES-16 satellites are able to provide "extremely high-resolution imagery" to forecasters, which is "critical to see how hurricanes are evolving" and whether they're strengthening or weakening, Bell said. The GOES-16 satellite is the "most advanced weather satellite NOAA has ever developed," according to its website. Wind shear is the change in the wind's direction or speed with increasing altitude and is the most effective hindrance for a tropical system. High wind shear can hinder the formation of a tropical system. If the system is already formed, the wind shear can tear it apart. Meteorologists monitor water temperature because warm water gives energy to fuel storms. If a disturbance is headed into a colder area of the ocean, it will start to weaken. Hurricane Irma, expected to make landfall in Florida as a Category 5 storm Sunday morning, traveled over extremely warm ocean waters. The combination of warm water and low wind shear led to a perfect scenario for the storm to strengthen -- and maintain that strength for a record amount of time. Models are also used to forecast the steering factors of the storm, meaning where the storm will go. Due to trade winds, the general movement of a disturbance is from east to west across the Atlantic Ocean. But other atmospheric conditions will determine a possible path for the storm in each model scenario. For instance, a strong high pressure over the Atlantic could lead a storm to ride along the ridge of high pressure in a clockwise motion, or a trough moving west to east could carry or push a storm one way or another. As soon as the National Hurricane Center gets wind of a tropical wave forming in the Atlantic, it sends its tropical weather outlook with a highlighted note indicating that it is watching a particular area for the development of a storm. Once the tropical wave develops enough, it will be designated an invest -- a specific area of disturbed weather -- and given an identity. This allows meteorologists to track model forecasts in the form of spaghetti models, which compose all the model forecasts into one graphic to give an example of possible paths. The invest/disturbance then becomes a tropical depression or tropical storm if winds of 39 mph or higher are detected. Storms are only named once they are deemed a tropical storm. During the lead-up to naming a storm, and throughout the duration of a storm, the National Hurricane Center will send hurricane hunter planes out to the storm's location to collect data. This forecasting method becomes crucial when naming a storm and for all updates going forward. 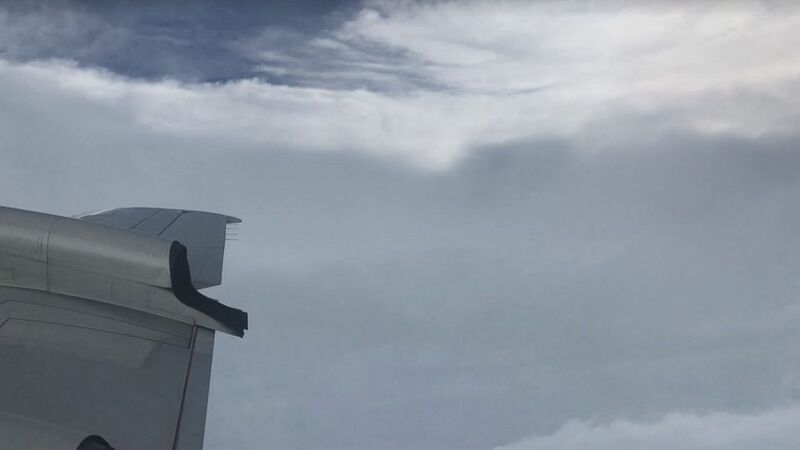 (NOAA) The National Oceanic and Atmospheric Administration's Hurricane Hunters flew into the eye of Hurricane Irma, Sept. 6, 2017. Once a tropical storm is named, the National Hurricane Center becomes forecasters' resource for all the official paths and updates on sustained winds, location and movement. Included in the National Hurricane Center's public advisories -- which are sent out every three hours -- are summaries for watches and warnings, the hazards affecting land and a 48-hour outlook. Forecasters anxiously await the advisories for the latest information on the storm's strength along with updates on watches and warnings. While the National Hurricane Center puts out its forecast, it's important to note that other models -- such as the American and European -- are still coming up with their own predictions, and the spaghetti models can show a wide variety of options.